Here is an article about different mulching materials and what they are suited for in the garden. I hope some of you will be able to use it. Thank you for being part of our garden group. If you are no longer interested in receiving these garden reports please let me know and I will remove your name from the list. If you have any garden questions please write me. Compost tea(ACT) is always available - please write for prices. Which mulch materials are best for your garden's needs? If organic gardeners named a most valuable player after every season, mulch would win over and over again. Mulch prevents weeds from sprouting up in your garden, keeps soil moist and aerated, protects your plants from soilborne diseases, replenishes the soil as it decomposes, and keeps your yard and garden looking well tended. But which mulch is best for your needs? And how much mulch to use and when to use it? We asked a few leading experts to answer those very questions for you. For Vegetable Gardens: Mulch comes in a lot of different forms, many of them at a price you cannot beat—absolutely free. 1. Grass clippings: These are great for vegetable, annual, and herb gardens, because you can get them by the bagful (though never use grass that you suspect has been treated with herbicide). They decompose quickly, especially in very hot weather. If applied too thick, they tend to mat down and become impervious to water. Start with a 2-inch layer and reapply often. For best results, allow grass clippings to dry before spreading them. 2. Leaves: If weed control is your goal, shredded leaves are your star. Leaves from just about any deciduous tree work well. Contrary to popular belief, leaves such as oak will not acidify the soil. Oak leaves are acidic when they are fresh, but they lose this acidity as they decompose. To keep the whole leaves from blowing away or forming an impenetrable mat, coarsely shred or chop them (running them over with a lawn mower is an easy way to do it). Like grass, leaves should be spread 2 inches deep and replenished as needed. When you dig into soil that's been mulched with leaves, you'll find lots of plump earthworms, who thrive on turning them into the best fertilizer for your garden. Climate concern: "Heavy, easily matted materials like wet tulip-poplar leaves do not work well in cold northern climates," says Mary Meyer, Ph.D., professor of horticultural science at the University of Minnesota. Wet leaves can easily freeze into a block of ice, damaging plants instead of insulating them and often leaving a mess behind when they thaw, Meyer adds. 3. Pine needles: The foresty scent is reason enough to use pine needles, but they are also attractive as they decompose (slowly) and they allow water to seep through easily. Though they come from plants that prefer acidic soil, a 2- to 3-inch layer of pine-needle mulch will not substantially change the pH of your soil. 4. Straw: If you are buying straw for mulch, be sure you get straw and not hay. Straw has just the stems of plants; hay has the seedheads, which will sprout into weeds in your garden. 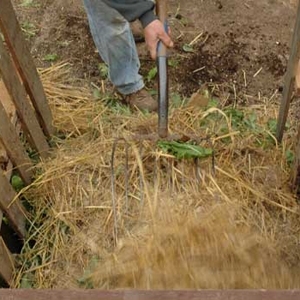 Straw breaks down quickly, adding nutrients to the soil. Because straw does not mat like grass or leaves, you can pile it 6 to 8 inches deep in your vegetable beds and strawberry patch. Climate concern: In very rainy climates, avoid straw mulch, because wet, partially rotting straw makes a perfect hideout for slugs. Cover crop. Plants such as hairy vetch or alfalfa that you grow specifically to improve your soil—sometimes called green manure—are effective as mulch, too. We planted a cover crop of oats in our Pennsylvania test garden in late summer, and when it died back the following spring, we simply dug holes for tomato transplants right through the oats. "Plant a winter legume like hairy vetch in the early fall," advises Paul Hepperly, Ph.D., research and training manager at the Rodale Institute, in Maxatawny, Pennsylvania. "When the hairy vetch flowers, cut it down and leave the residue as mulch." Caution: Do not let hairy vetch produce seed, as it will sprout where you don't want it. 5. Plastic: We generally prefer mulching with organic matter that builds soil as it decomposes. But where you need to heat up the soil—for growing melons and other warm-weather crops in cooler climates, for instance—or for total weed control, plastic can be very useful. Clear plastic warms the soil best but allows weed growth. Black plastic inhibits weed-seed germination as it warms the soil slightly. Newer (more costly) types, such as infrared transmitting (IRT) plastics, combine the weed-control ability of black plastic with the soil warming of clear, and have been shown to improve plant growth and, in some cases, yields. Where you are growing perennials or in other spots where you don't turn the soil often, you can use mulch materials that break down very slowly or not at all. These also tend to be more attractive than the mulches we've already covered (though a cover crop of red clover is quite lovely). 1. Bark: Typically sold as chips, nuggets, or shredded pieces, bark decomposes slowly but stays in place well (pine bark nuggets may float in a heavy rainfall). You'll find both hardwood and softwood options. Common hardwood types include hickory, oak, and elm. Softwood bark, such as pine, fir and redwood, decomposes more slowly than hardwood. Stay away from cypress mulch, because over-harvesting is depleting vital coastal wetlands, and studies have proven it to be no more durable than more sustainable choices. Douglas-fir bark mulch is ideal for gardeners in the Northwest, says Rita Hummel, Ph.D., environmental horticulturalist at Washington State University. "It works well in landscapes and is readily available here." Coarse-textured mulches like bark can be layered up to 4 to 5 inches thick, because more air circulates between the bigger particles and water passes through them more easily than it does with finer-textured mulch like grass or leaves. Watch your wallet: Bark mulches can be expensive to use in large areas. 2. Wood chips: You can find tree and utility companies, arborists, and yard-waste facilities willing to give you wood chips for free. They tend to lose color more quickly than bark mulch. Wood chips are a good choice for paths and where you have a lot of ground to cover, but don't use them close to your house, because termites and other destructive insects may be living in them. A popular low-cost choice for landscaping is a recycled mulch made from construction wastes and wood pallets. Keep this away from your vegetable garden, as it may contain unknown industrial contaminants. Furthermore, a University of Ohio study showed that the use of ground pallet mulch offers little benefit to the microbial soil community. Aerial Attacks: "Wood mulch can harbor the artillery fungus," warns Hepperly, "which shoots a black, sticky spore into the air. This can be a nuisance if it lands on your house siding and even your car's paint job." Current research shows that mushroom compost (available in garden centers), suppresses these shooting spores. Pennsylvania State University researcher Donald Davis, Ph.D., recommends using a mulch mix of 40 percent compost, 60 percent bark (not wood) if you are concerned about an artillery assault. But, he says, "even 20 to 25 percent mushroom compost would likely help." 3. Newspaper: A four-sheet layer of newsprint is very effective at suppressing weeds. Wet it down and cover it with a layer of bark chips, and you'll have beautiful and hard-working mulch layer for any ornamental bed. Ink issues: We do not recommend using colored newspaper in the vegetable garden. Researchers at West Virginia University who have done extensive research using newspapers in vegetable production caution against using slick paper of any kind in the garden. These materials may still contain heavy metals, they report. 4. Rocks/stone/gravel: Durability is both the appeal and the drawback of stones as mulch. They stay put and don't degrade, which means they don't need to be replenished but neither do they improve the soil. Use in paths or around trees and shrubs about 1 inch deep for good weed control and water permeability. Climate Concern: "In hot regions like the South, rocks can radiate heat and cause extreme temperatures around plants," says Gary Wade, professor and extension coordinator at the University of Georgia. "This encourages water loss and can result in severe plant stress. On a hot day, rock mulches in full sun can cause the temperature around the plant to soar into the triple digits." Source: Paul Hepperly, Ph.D., research and training manager at the Rodale Institute, in Maxatawny, Pennsylvania. Is redwood sawdust good to use for mulching blueberries? Or, will is not allow anything, including my blueberries, to grow. From what I have read, it is common to use sawdust for mulching blueberries because it helps to lower the pH of the soil and blueberries are an acid-loving plant. However, I also saw some suggestions that mulching with sawdust might require additional nitrogen fertilizer because microbes will use nitrogen in the soil to break down the sawdust. If you choose to mulch with sawdust, keep an eye on your plants to make sure they don't start showing signs of nitrogen limitation.